As 2011 comes to a close, many busy executives and IT managers will be pondering the continued adoption of cloud applications within their organizations. How can a business be adequately prepared for the anticipated increase in demand for managed cloud services? Moreover, what are the key related market indicators that are shaping the future of emerging business technology deployments? The Cisco Global Cloud Index is an ongoing effort to forecast the growth of global data center and cloud-based IP traffic. The forecast includes trends associated with data center virtualization and cloud computing. From 2000 to 2008, peer-to-peer file sharing dominated Internet traffic. As a result, the majority of Internet traffic did not touch a data center, but was communicated directly between Internet users. Since 2008, most Internet traffic has originated or terminated in a data center. Data center traffic will continue to dominate Internet traffic for the foreseeable future, but the nature of data center traffic will undergo a fundamental transformation brought about by cloud applications, services, and infrastructure. By 2015, one-third of data center traffic will be cloud traffic. The Internet may not reach the zettabyte era until 2015, but the data center has already entered the zettabyte era. While the amount of traffic crossing the Internet and IP WAN networks is projected to reach nearly 1 zettabyte per year in 2015, the amount of data center traffic is already over 1 zettabyte per year -- and by 2015 will quadruple to reach 4.8 zettabytes per year. This represents a 33 percent CAGR. The higher volume of data center traffic is due to the inclusion of traffic inside the data center (Typically, definitions of Internet and WAN stop at the boundary of the data center). The global data center traffic forecast, a major component of the Global Cloud Index, covers network data centers worldwide operated by service providers as well as private enterprises. Functional separation of application servers and storage, which requires all replication and backup traffic to traverse the data center. Functional separation of database and application servers, such that traffic is generated whenever an application reads from or writes to a central database. Parallel processing, which divides tasks into multiple smaller tasks and sends them to multiple servers, contributing to internal data center traffic. The ratio of traffic exiting the data center to traffic remaining within the data center might be expected to increase over time, because video files are bandwidth-heavy and do not require database or processing traffic commensurate with their file size. However, the ongoing virtualization of data centers offsets this trend. Virtualization of storage, for example, increases traffic within the data center because virtualized storage is no longer local to a rack or server. How does the transition of workloads from traditional data centers to cloud data centers effect the typical IT environment? Find the answer to this question, and learn more about the implications, by browsing the Cisco Global Cloud Index forecast data. 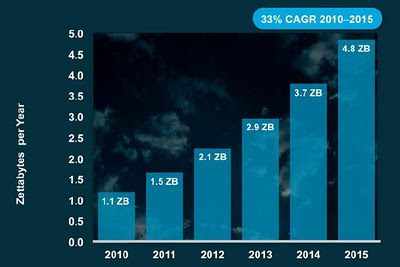 Cloud computing demand will drive new IT spending over the next five years, as public cloud service providers and the adopters of private cloud solutions invest in the supporting infrastructure, according to a recent market study by International Data Corporation (IDC). Therefore, the leading managed cloud service providers have been busy expanding their service delivery platforms. Overall spending by public cloud service providers on storage hardware, software, and professional services will grow at a compound annual growth rate (CAGR) of 23.6 percent from 2010 to 2015, while enterprise spending on storage for the private cloud will experience a CAGR of 28.9 percent. 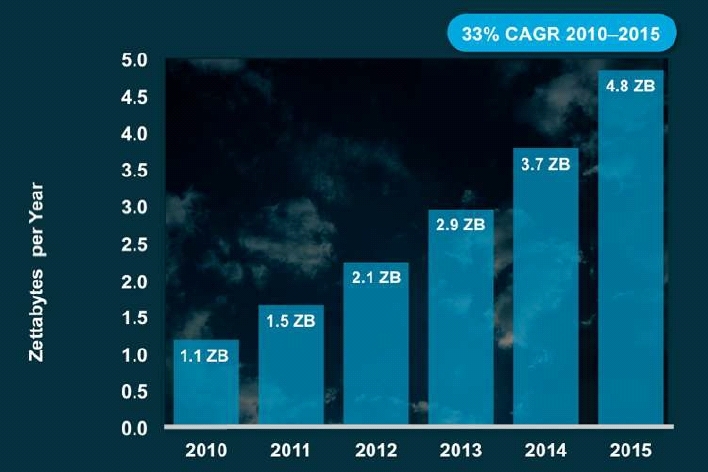 By 2015, combined spending for public and private cloud storage will be $22.6 billion worldwide. "Despite current economic uncertainties, IDC expects cloud service providers -- both public and private -- to be among the most expansive spenders on IT products and services as they continue to build out their facilities worldwide and expand their service options," said Richard Villars, vice president, Storage Systems & Executive Strategies at IDC. According to the IDC assessment, the most significant driver of storage consumption over the past three years has been the emergence of public cloud-based application and infrastructure providers. Many of these service providers act as content depots -- gathering, organizing, and providing access to large quantities of digital content. Meanwhile, other cloud-based service providers have emerged with a focus on delivering IT infrastructure and applications in an "as a service" model. Collectively these companies have undertaken massive storage buildouts as they have expanded their service offerings, entered new markets, and extended their geographic reach. In parallel to the expansion of the public cloud, many organizations have started to deploy their own private clouds for application, compute, and archival storage. Some of these private cloud deployments -- government and research sites -- are comparable in scope and complexity to public cloud environments, while others are limited in scope. Enabling more efficient delivery of information/applications to Internet-based customers. Reducing upfront infrastructure investment levels (i.e., cutting the cost and time associated with deploying new IT and compute infrastructure). Minimizing internal IT infrastructure investment associated with "bursty" or unpredictable workloads. Lowering and/or distributing the ongoing costs associated with long-term archiving of information. Enabling near-continuous, real-time analysis of large volumes and wide varieties of customer-, partner-, and machine-generated data (Big Data). To meet these diverse requirements, IDC believes that organizations will continue to demand access to low-cost storage capacity -- plus a growing range of complementary advanced data transformation, security, and analytics solutions. "The challenge facing the storage industry will be to balance public cloud service providers' demand for low-cost hardware while boosting demand for advanced software solutions in areas such as object-based storage, automated data tiering, Big Data processing, and advanced archiving services," noted Villars. "Big Data developments will be perhaps the most critical new marketplace for storage solutions providers in the coming decade. Providing a strong portfolio of complete Big Data solutions -- hardware, software, and implementation services -- will be a high priority to succeed. Similarly, a strong portfolio of active archival storage solutions will be a critical differentiator for private content or archive cloud deployments." Telepresence and other forms of advanced visual collaboration technologies are moving further into the mainstream of forward-looking business practices. This increase in adoption has been a global phenomenon, as more business leaders follow the numerous application examples of the early-adopters. Infonetics Research released excerpts from its second quarter 2011 (2Q11) "Enterprise Telepresence and Video Conferencing" report. Their findings demonstrate the progress that's been made so far this year. Their latest market study provides insights on market size, vendor market share, and analysis for PBX-based video phones and software, as well as dedicated video conference infrastructure and endpoints -- including immersive telepresence and software. For the first 6 months of 2011, enterprise telepresence and video conferencing equipment revenue is up 24 percent year-over-year -- and according to the current Infonetics market assessment, they expect strong double-digit growth in 2011 over 2010. "Growth will stay in double-digit territory through at least 2015, thanks to demographic and communication trends favoring video, increasing acceptance of video among users, and specific use cases like tele-learning and tele-medicine," notes Matthias Machowinski, directing analyst for enterprise networks and video at Infonetics Research. The global enterprise video conferencing and telepresence equipment market jumped 21% to $683 million between the first and second quarters of 2011, setting a record high for quarterly revenue. Year-over-year (2Q10 to 2Q11), the market is up 34 percent. Cisco, the leading vendor, sequentially increased its videoconferencing and telepresence system revenue 33 percent, and now holds over half the global market share. 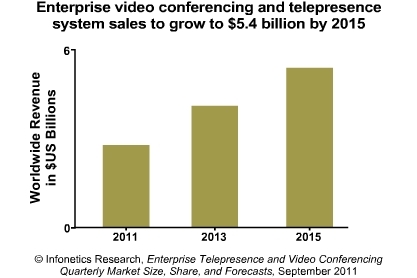 Infonetics forecasts the enterprise telepresence and video conferencing equipment market to grow to $5.4 billion by 2015. Dedicated multi-purpose room video systems make up over half the enterprise video equipment market now and will continue to be the biggest revenue-generator among enterprise video solutions. Meanwhile, videophones are the fastest-growing segment of the market; they are the smallest in size. Regionally, the strongest demand for enterprise video equipment is coming out of North America, China, India, and Brazil.